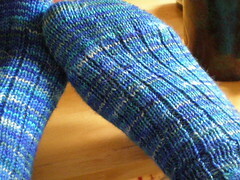 These really were a joy to knit and a very simple, yet clever, pattern. 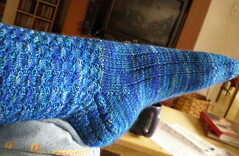 I love the way the ribbing flows into the cables that flow into the smooth pillars that extend down the feet. 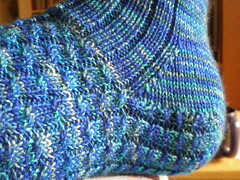 I love the way the cables hug the heel. I love this yarn, the colorway, the soft feel, suddenly all the raving about Fleece Artist yarns begins to really make sense. It totally is that awesome. 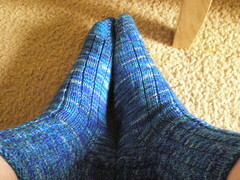 I had the rather distressing sock epiphany that I knit these on needles that were really not quite right for the yarn. It gave me this wonderful squooshy soft fabric that is juuust a titch looser than socks ought to be. I’m noticing the same problem with my Tempted Pin Up Girl socks. I knit both on #2’s. For durability, next time, I think I’ll try #1.5’s and see if that makes them feel more durable. Tempted’s base yarn is very similar to the Fleece Artist 2/6 merino yarn I used for these (in gauge and also in fabulosity.) So, mental note, go down half a needle size the next time I use either yarn. These are soft merino 2 ply sock yarns, they want to be knit a little tighter for maximum sturdiness. Looks like these and also the red Tempted socks are going to be worn mainly around the house and not see a lot of heavy outside action. But that’s ok. I need something cuddly and gorgeous to wear with my pajamas anyway. Apparently the teenager’s luggage is still wandering around the Deep South without a chaperone. I do hope it doesn’t get in to any trouble.